35/123 David Mumpower I know that most critics despise this film; I am of the opinion that Tim Allen used his personal history to make an engaging little film. I laughed a lot. 150/190 Max Braden The Six Wives of Henry Lefay is better, but not by much. Imagine a stand-up comedian born to humble beginnings, who pays his dues on the club circuit with healthy rations of observational humor, off color relationship jokes and clever word play. One day, he’s offered his own television show – a weekly showcase of deprecating personal humor that airs for eight years and is never – ever out of the top ten. Savvy as he is popular, he quickly turns television success into a minor multimedia empire and today is one of the more successful actors in Hollywood. Admit it, at first you thought I was talking about Jerry Seinfeld but now you aren’t sure, are you? Jay Leno sounds like a stretch. You’re probably pretty sure I’m not talking about Martin Lawrence - and you win bonus Geek Points if for some reason you said Garry Shandling but no, I’m talking about Tim Allen. You know, Tim Allen - star of a number of blandly inoffensive yet profitable hits starting with Home Improvement. A lot of people deride him for his style, citing pedestrian efforts like The Santa Clause and undercooked neo-adolescent slapstick like Wild Hogs. I have no problem admitting that I dislike those movies too, and with one exception (Galaxy Quest), the only things I’ve ever liked him in were the things where I can’t see him (such as Toy Story). But regardless of what anyone else thinks, Allen is closely associated with – by my informal count - well over a billion dollars worth of box office. You really have to accept that the man is money, and that tends to come to people who have very broad appeal. When you see Allen on screen it isn’t hard to imagine him as your brother, your father or at least a good friend. For a comedian, his level of acting talent is probably just above average but he isn’t afraid to seem ordinary or to make fun of himself, and that lack of pretense goes a long way. Sometimes, the secret to being adequate is just to play your strengths and avoid your limitations - just give people a good chuckle without making them uncomfortable and they’ll be glad to hand you their money over and over again. Now, I occasionally get a hard time from friends for being so impressed with profitability and I’ll confess to it without hesitation. But it’s a fact that nothing gets more movies made than movies that make money. That’s not to say that because a movie makes money it is necessarily a great movie, but it does mean that someone came up with something that almost everyone liked. That usually requires a lot of creative and business savvy. And if you manage to make a habit of appearing in those types of films that usually indicates a great deal of personal savvy – talent can only get you so far. And if you get there as a small town stand up comedian who grew up without his father and spent two years in the cooler on Federal drug charges – that’s just money, my friends. The entertainment business isn’t an easy place to make a living, so people who are famous despite themselves make for a great story. 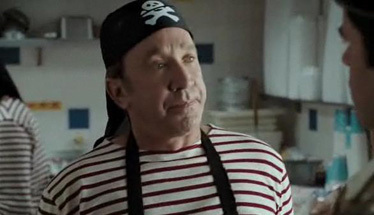 And Tim Allen’s story is a big part of what he does; it gives him an earnest, reliable disposition. Like him or not, it’s something that moviegoers never seem to get tired of. All that that good will from audiences is mirrored by his reputation in Hollywood, where Allen’s success ensures he has no trouble finding people to work with, or people willing to work with him. ON board for Allen’s directorial debut is a fairly diverse cast, several of whom he’s worked with before. Sigourney Weaver, Ray Liotta, Kelsey Grammer and Julie Bowen are alongside to star in Crazy on the Outside, a story that resonates personally with its director, and looks a bit more mature than the average Tim Allen laugher. In it, Allen plays a parolee who finds readjusting to family life to be harder than he’d imagined. A complicated relationship with his parole officer (Jeanne Tripplehorn), a shrewish older sister (Weaver) and her hot headed husband (J.K. Simmons, typecast again) make life at home almost as excruciating as being under lock and key. Allen has discussed his incarceration before, most notably in his autobiography. But up to now he’s never tried to open up about it in a film - which is interesting, but I’m pretty sure we won’t find more than superficial revelation here. Let’s remember that Crazy on the Outside is meant to be a PG-13 comedy/drama so a little slapstick here, a few hugs there along with a morally uplifting coda are probably as close as we’re going to get. I suppose there’s the possibility I’m overstating all this - this could be just another comedy with no autobiographical pretenses at all - but I doubt that. It’s almost inevitable that long tenured actors will take a few personal risks late in career, attempting to face down some old liabilities. And as I mentioned earlier, more than several of his collaborators in Crazy on the Outside have worked with him before, some repeatedly. One gets the sense Allen was creating a support system of trusted colleagues around himself for this exposition. Maybe there are some unpleasant memories in his life that Tim the Tool Man is finally ready to get some laughs out of. See the latest developments for this project on the Crazy on the Outside Movie News page.